For the family of a child with cancer, an overflowing garden shed or unruly lawn might not seem the most pressing of problems. But according to senior nurse David Widdas, it can be the straw that breaks the camel’s back. While it certainly isn’t the responsibility of the NHS to clear sheds or cut grass – much as it might improve the lives of families – it is something that the trust’s growing army of volunteers has been more than happy to deal with. The trust’s community children’s nursing team has introduced volunteer roles that involve working with families of children with complicated health conditions. It is part of its overall drive to increase the number of volunteers, and patients, families and staff are feeling the benefit. South Warwickshire is not alone in increasing its volunteer workforce. December saw the launch of HelpForce, a community interest company with the ambitious aim of doubling the number of volunteers working in the NHS by 2021, from the current figure of around 78,000. HelpForce, set up by Sir Thomas Hughes-Hallett, chair of Chelsea and Westminster Hospital NHS Foundation Trust and a former chief executive of Marie Curie, is working with 12 trusts initially to develop new volunteer roles and develop best practice models for volunteering in hospitals and other NHS settings (see box). Sir Thomas, an ebullient former investor banker who also has philanthropist and barrister on his extensive CV, believes that volunteering is good for patients, health service staff and the volunteers themselves. ‘At Marie Curie, our paid staff were amazing but we couldn’t have done all the things we did, particularly in hospices, without the amazing generosity of the British public,’ he says. He was interviewed on the subject on BBC Radio 4’s Today programme in 2015, which brought an ‘extraordinary reaction’, he says, with near-universal support for his ideas. Illness caused the project to be put on hold for a time, but with the encouragement of his wife and of Jim Mackey, then chief executive of NHS Improvement, he decided to make it happen. 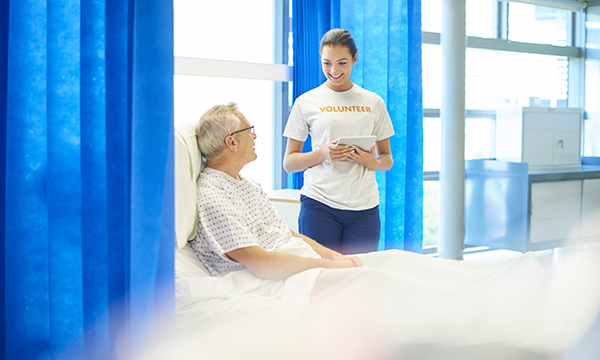 The volunteers currently working in the NHS are rarely integrated into NHS strategies or service delivery plans, which Sir Thomas sees as a missed opportunity. HelpForce will initially be focusing on times when staff and patients would like more support, such as at mealtimes or on discharge. For example, when a patient is ready to go home they will be assigned a volunteer who will ease the process, such as by collecting prescriptions from the hospital pharmacy, accompanying the patient home and even stopping en route for a bottle of milk and a loaf if needed. Unions, including the RCN and Unison, have welcomed the idea and have been helpful, says Sir Thomas, who stresses that volunteers are in no way replacing roles that are and ought to be paid. Carrie Smith is voluntary services manager at University Hospital Southampton NHS Foundation Trust, one of the HelpForce pilot sites. She explains that her trust is introducing a new ward-based volunteer role that combines mealtime assistance, getting patients up and moving, and befriending. It builds on previous successful work to introduce mealtime assistants. ‘We want patients to keep eating, drinking and moving,’ she says. ‘Some volunteers think they will just come in to befriend people – to cheer up an older person,’ she says. ‘But we’re saying we’ll train you up so that you can help to feed people, for example. Volunteers span a wide age range, from school and college leavers who are thinking about careers in healthcare to retired people who want to give something back. Often they are retired healthcare workers, including nurses, says Ms Smith. ‘We ask people to commit to three hours a week for six months or more, because we are investing in training them. The trust runs a volunteer induction programme, which includes advice on issues such as maintaining boundaries with patients – ‘we want them to be friendly, but to think of themselves as a “professional” friend,’ says Ms Smith. The induction also covers safeguarding, infection control and data protection, as well as in-depth specialist training on nutrition and moving. Research into the mealtimes assistant project showed that trained volunteers made a positive difference, improving the quality of mealtime care for patients and nursing staff. Mr Widdas at South Warwickshire has no doubt that a volunteer service is a valuable part of the workforce in the community as well as in hospitals, provided it is properly run and integrated. ‘I think volunteering is a brilliant thing, but you have to be clear that it’s different to what’s already being funded,’ he stresses. Having already worked with the charity Together for Short Lives to focus on helping siblings of children with life-limiting conditions, the South Warwickshire trust will use HelpForce funding to take its volunteering programme to a new level, looking more widely at hands-on clinical care. Chelsea and Westminster Hospital NHS Foundation Trust is testing ‘bleep volunteers’, who support patients and staff with a range of tasks. It is focusing on using volunteers to help with patient discharge and transport. Northumbria Healthcare NHS Foundation Trust is developing volunteer roles at a treatment day centre and to support discharge at intermediate care units. Sandwell and West Birmingham Hospitals NHS Trust is asking volunteers to help with mobility on wards, linking with the #endPJparalysis campaign encouraging patients to dress in day clothes instead of pyjamas. West Suffolk NHS Foundation Trust is looking at how volunteers can support discharge planning and work in the community to support early intervention teams and help link patients to community assets and services. You can enjoy access to a personal selection of 10 articles every month from our specialist nursing titles FREE with your Nursing Standard subscription – including an evaluation of a project introducing volunteers in a dementia ward. Read the article here.